Premium Saxophonist Beejay sax is taking a leap and raising the bar as he hosts his first concert tagged “BEEJAYSAX LIVE” at the Eko Hotel And Suites Victoria Island, Lagos on Sunday, 14th of May 2017. In the gospel circle, Bolaji Banjoko popularly known as Beejay Sax has tipped off what can be described as phenomenal Event with his choice of venue, an ideal location for premium entertainment for the spirit, soul and body. While speaking on planned event, “I want an event that will send a big signal to the entertainment industry in Nigeria. “Also in 1 Corinthians 2:4 – My message and my preaching were not with wise and persuasive words, but with a demonstration of the Spirit’s power. When asked about featured music ministers, Beejay expalins that all music ministers to feature will revealed as the date and day draws near. 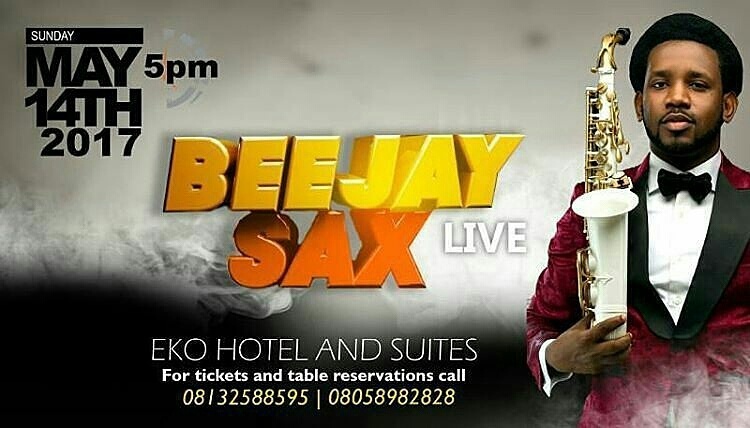 Everyone should follow our Social Media Hashtag Thread #BeejaySaxLive for Update. Venue: Eko Hotel And Suites Victoria Island, Lagos. For Tickets and Table Reservations call: 08132588595, 08058982828.